The socialisation with the dog continues. I am writing up a progress report as we go, will share another post in a few weeks, might not be of much interest to other people but a good diary for us to look back on. I see little bits of progress every day. First day back at work, nice to be back I have to say. Looking for new things to try and have seen #zenart on instagram. So gave it a try. Have to say did not do overly well at it despite printing off step by step guilds on Pinterest. May have another try at some point. Trying different ways to socialise Dixie and so we wandered down to DD1 again once the three wee ones were in bed. She is definitely more relaxed in the house than she was. She was quite happy to be handed to Fifi and for me to walk towards Fifi and get stroked. But if I had hold of her and Fifi walked towards me the growling started again. But still a small step in the right direction. Tonight I got DD1 to come up and come in the house. 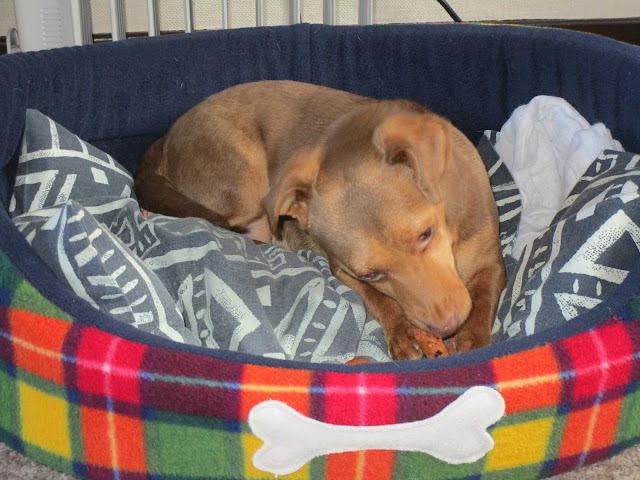 Our problem is we do not get many visitors but I still need a dog that will relax and be comfortable with people in. So we walked down the road to meet DD1 and for Dixie to say hello to her in the street and then DD1 held the lead and brought her into the house. Dixie had a few growls but was willing enough to take pieces of chicken from her. Dixis sat on her knee for 10 minutes while we all held a conversation and DD1 stroked her and talked to her and she was pretty relaxed and happy to stay on her knee. But when she put her down and Dixie went back to hubby she started barking again. She did venture over for more bits of chicken but with low growling. Might not sound good but a step in the right direction as far as I am concerned. We had her out for a walk today, hubby was trying to get her interested in digging under rocks that he moved for her. A win over on Instagram got delivered today. 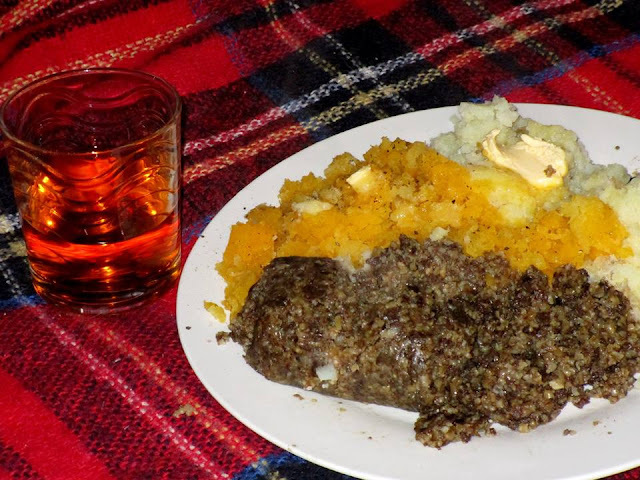 The haggis bites were to spicy for me but hubby enjoyed them and the mash and turnip ( which has milk and butter in). 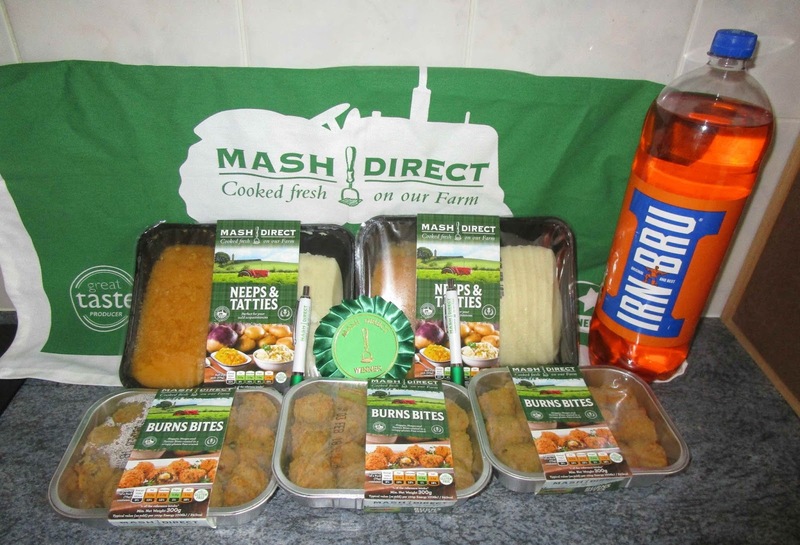 He is fussy about mash potatoes but said these were a good solid none mushy potato, great consistency and very tasty. 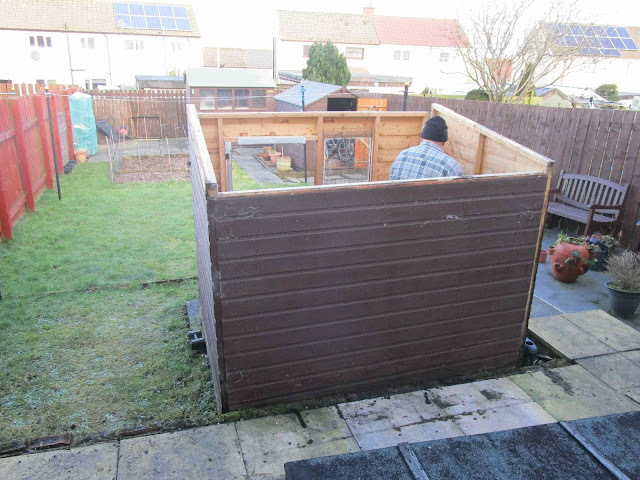 Today we have got the small shed reassembled at the bottom of the garden. Had to get SIL1 to help hubby get the roof on as I was not risking messing the shoulder up again. Burns Night, so yes we had haggis tatties and neeps. This is hubbys tea, ( hence the butter dolloped on the potatoes as in this house mashed potato is exactly that, mashed potato with nothing added) his haggis of choice is McSweens, in our opinion the best make on the market. 'I had the McSween vegetarian haggis as it is less spicy than the real thing and a very nice eat. Have to add the dog would not eat the bit I left her. 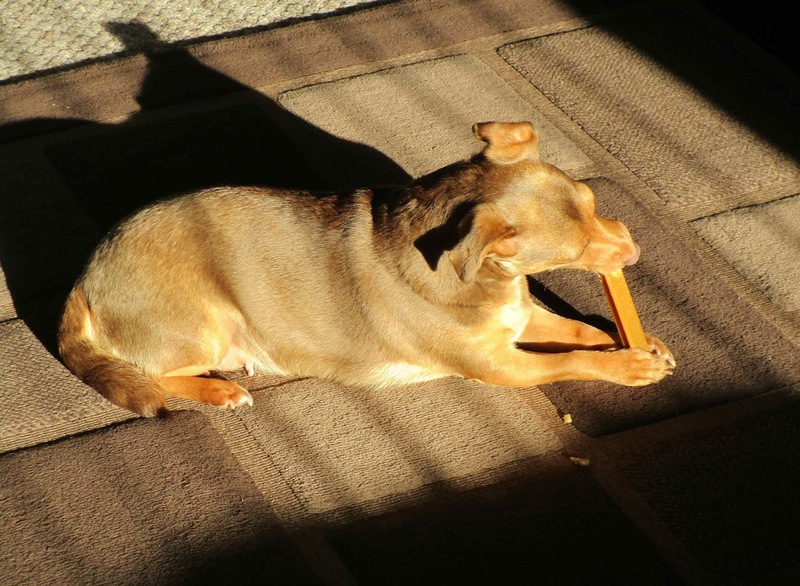 Dixie was lying in the sun chewing one of her denti stixs. 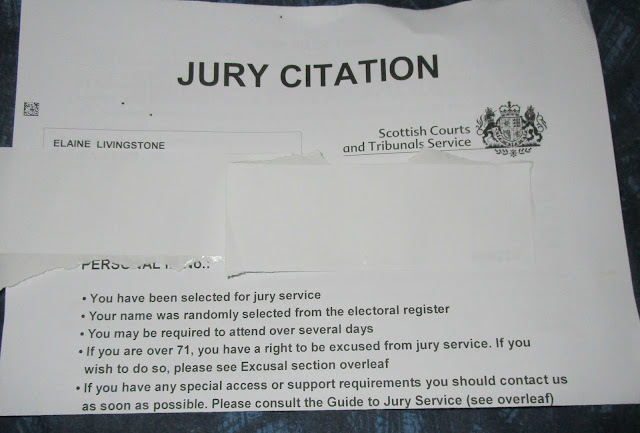 Got a Jury Citation as been picked to do jury duty, again, hated it the last time. I know other people have never been picked so why me a second time? Shame my sick line is not in place still. Most annoying thing about this is DD1 needs a babysitter for a family funeral that day and I cant look after them. Fitting Rustlers into your busy schedule. We all lead very busy lives at times and we all have a need to find a quick meal. One way is by fitting Rustlers into your busy schedule. Have you seen the Rustlers Southern Fried Chicken burger twin packs made using quality chicken marinated with a southern fried breadcrumb? Many parents and grandparents work, plus have other activities to fit in after school. I do the gymnastics run on a Monday evening and time I get in from work and then go back out to do this run and get back home again it is 6pm, and I really have no notion to start cooking anything much. For me I feel half the battle is forward planning for when you know you will have a few busy days rather than finding yourself heading to the take away on your way home. Better to save money and spend the time in the house with a simple meal cooking away in the oven rather than a queue in your local takeaway. I often do this by bulk buying in the supermarket and preparing and cooking food when I am not so busy and utilising the freezer. 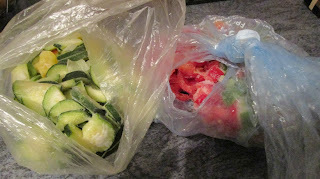 One of my favourite bulk preparation is vegetables. Prepared vegetables can be used for a variety of quick dishes. One of my favourites is oven cooked vegetable chips. Peel and chop potatoes, sweet potatoes and parsnips into chips. If using straight away pop into a roasting bag, add a tablespoon of oil and some flavouring. My flavouring of choice was barbecue chicken, added about half the packet, give the bag a good shake around, then pop them into an oven tray and cook for approx 30 minutes at 200 oC. 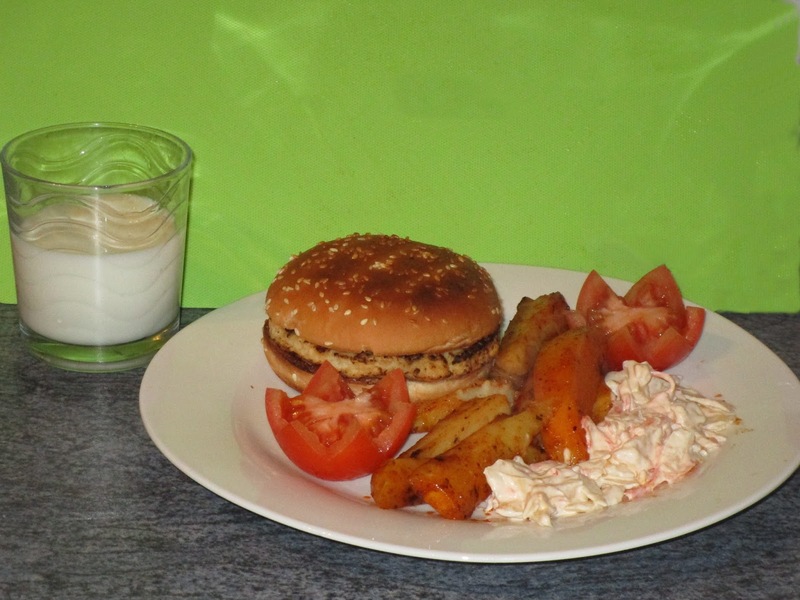 Once the vegetable were cooked we popped the chicken in the microwave and the bun into the toaster then reassembled it on the plate, added some of the vegetable chips a tomato and some coleslaw and serve with a drink of milk. The bun makes a great addition to a quick easy meal and the peppered mayo adds a great tang, you could always leave it on the side of the plate and dip the chips in it if you don't fancy it on the bun. If you are not using them all the vegetables at the time you prepare them they will freeze in the oven bag and then just need taking out of the freezer either in the morning you plan on using them if you have time or take them out as you need them and cook from frozen, they will take a bit longer but if you have children you can be helping with home work or bathing thee children, spending some quality family time while the food is cooking. I always cook extra so that I then have them available for another meal or a packed lunch. 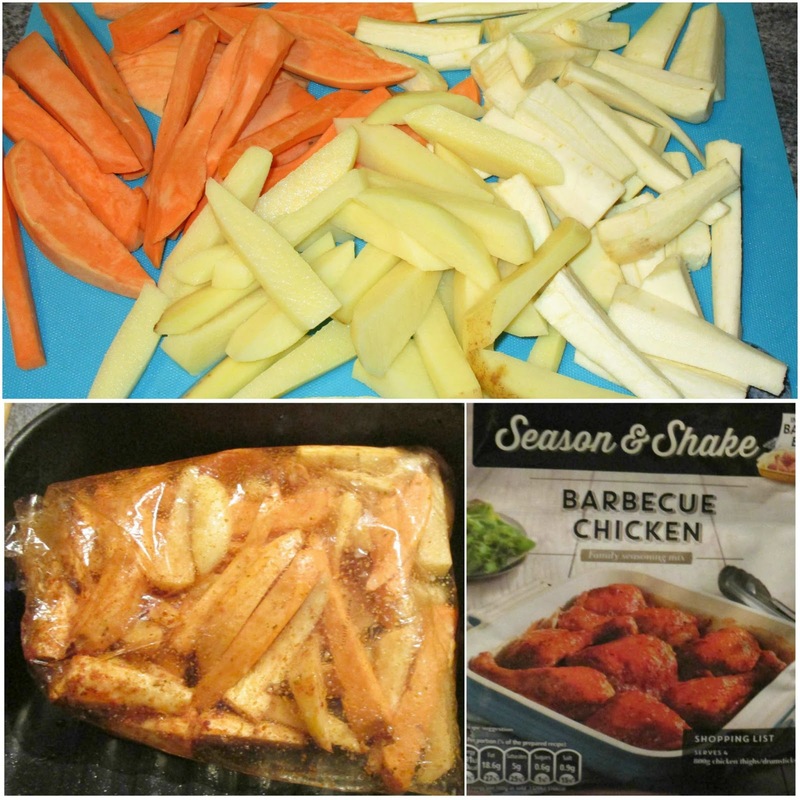 If you throw chicken portion or some sausages in the oven at the same time the vegetable chips are lovely cold the next day with the sausage or chicken added. Or why not make another evening meal out of it and add the cold cooked vegetable and meat to some cold cooked pasta? The pasta can be cooked at the same time as the vegetables. Have to say I am partial to a pan of soup made with the oven cooked vegetables, I think it adds extra flavour. I use them with some stock and either lentils or for a change add a tin of tomatoes and a tinned of drained chick peas and then puree when ready for serving. Great with some crusty bread. 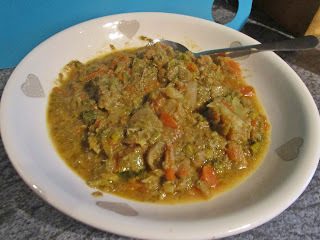 Another win win of having a meal for another night, again the cooked soup will freeze. 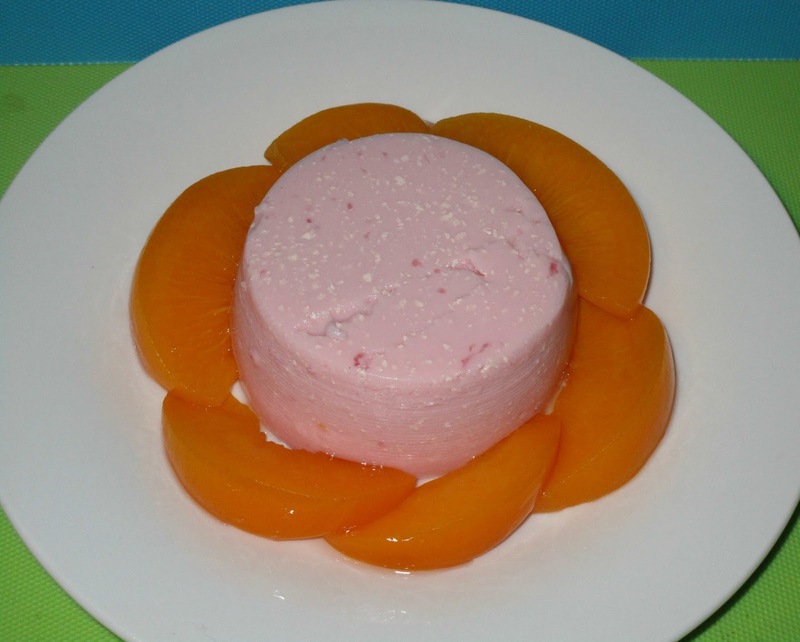 I finished off the meal with a sugar free jelly made with soya milk and some tinned peaches. I toyed with the idea of seven pictures of Dixie, but seemed a bit silly when she has her own starring role in a blog post already. Been using up some odds and ends out of the cupboard. Eeking out the dregs of the wages to get through to payday. One of the things I made was a chocolate krispie base with a tin of oranges layered across the top and then a nearly set milky jelly poured over the top. Very nice it was too. You can see my post and other ideas here. 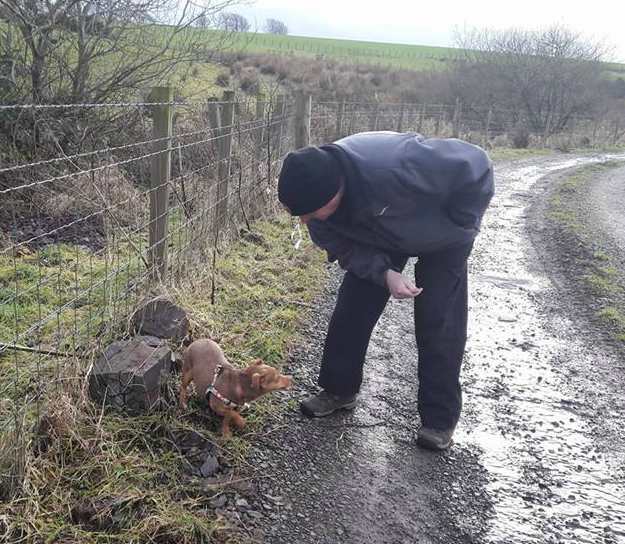 We had Dixie out for her first walk today. She has never walked on a lead before this, or seen street or walk passed moving cars. 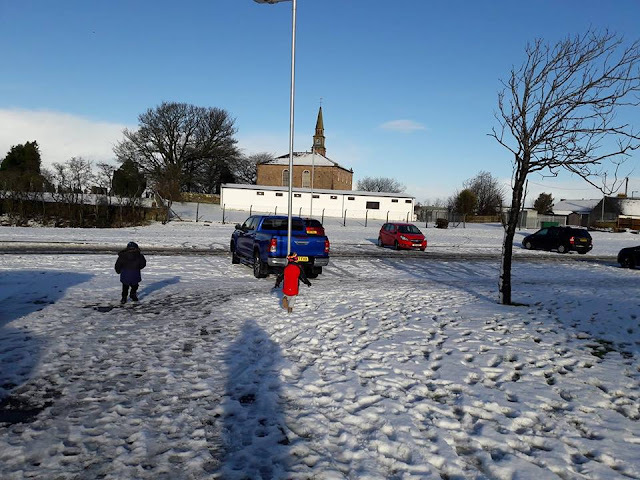 We have had some snow here, not half as much as other areas of Ayrshire but enough to be unpleasant. DD1 did not want to drag Spud back out in the cold again and SIL1 was stuck at work as he was struggling to get out for the snow. So I went and picked the twins up and got bombarded with snow balls on the way home. They were loving the snow. DD1 needed to register the twins for starting school in August but her car is off the road. The plan had been the other grandpa would run her in while I watched Bob and Spud but their wee village was snowbound with no passable roads so Bob came up here to stay with granddad and I took DD1 and Spud to town. 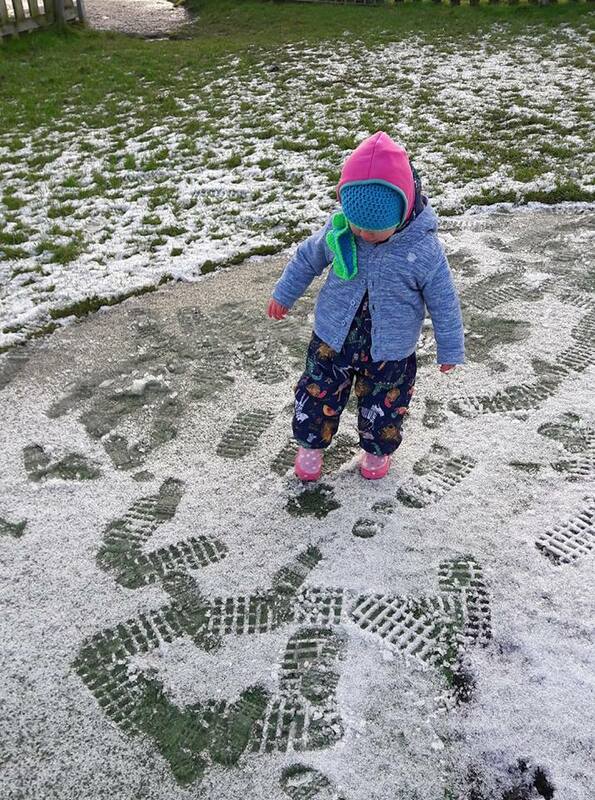 We played in the puddles and the light layer of snow until she came back out. We got back in time for me to pick the twins up from nursery while DD1 put her shopping away. Sadly one of the mums of a school friend of Fifi's died recently. She wanted to go to the funeral to be there for her friend, to show her her support. I thought that was very mature of her. So I picked her up from school and ran her to the funeral, took a wander round Dobbies while she was in there and then went back picked her up and brought her home. 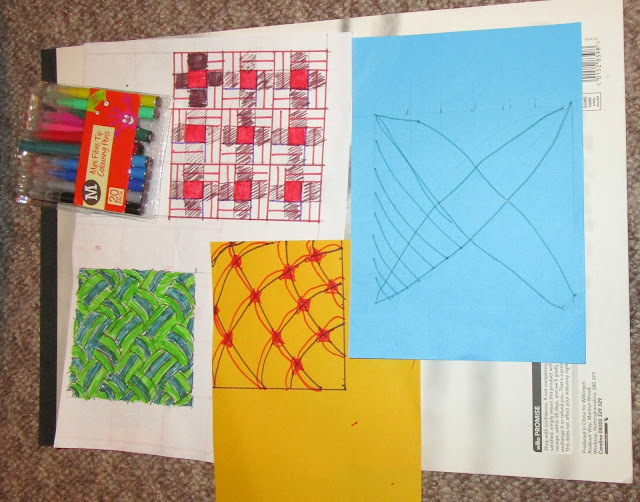 We had some nice conversation in the car, she was feeling positive about the results of her English prelim she had taken on Wednesday,and was looking forward to her art on Friday. We were also talking about our funerals when they come. We both want to be cremated, I want " the wonderful thing about Tiggesr" played as I go through the curtain, she wants some popcorn kernels added to her coffin so she can go out with a bang. 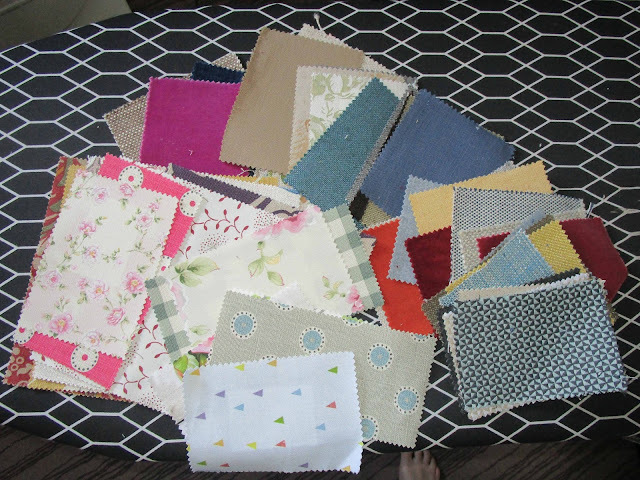 A fellow comper had these samples of material that he was nice enough to send to me for using. 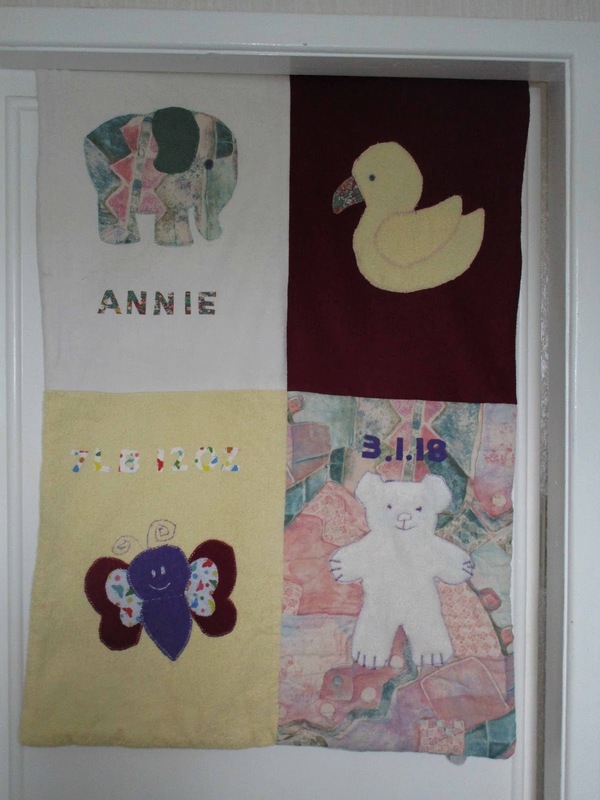 The baby blanket is ready for handing over. The yellow is towelling, the white and purple fleece and the elephant material is padded. Following on from last weeks Giggle Knickers it got me thinking. So to reduce my impact on the environment I decided to buy some reusable towels. No more going to landfill from me. Not tried them yet but will let you know what I think of them next week. Not quite sure why they make the bacl of them from silky material, will be interested to see if they move. For those of you that follow my blog you will know we have been looking for a new dog. The problem with this is my allergy issues. The one we rescued from the Dogs Trust last year had to go back after less than twenty four hours as he seriously affected my breathing. So as it is not only very difficult to "try before you buy" it is also distressing if it does not work out. 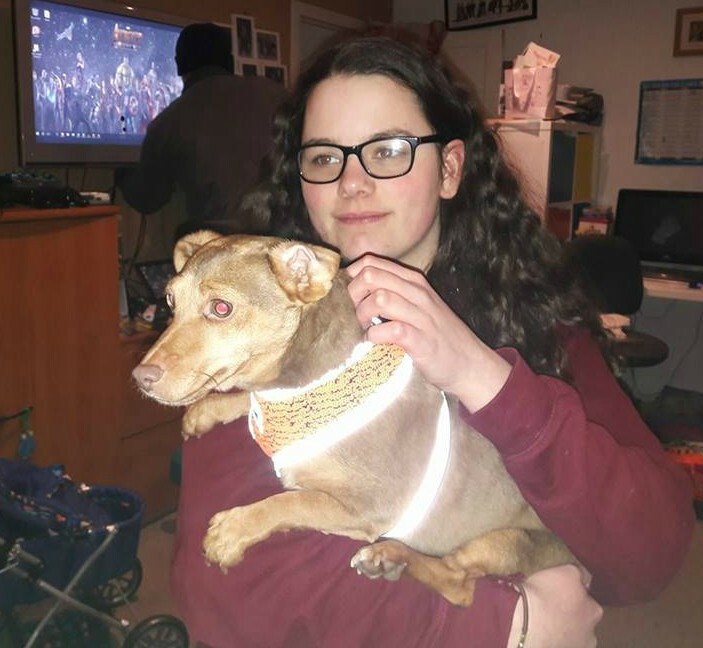 A friend of mine knew how desperately we wanted a dog and she also knew of a friend that was looking to rehome one of her young dogs, and kindly put us in touch with each other and last Friday we went over to meet young Dixie. We were allowed to bring her home on the condition if it does not work out for any reason now or in the future we have to take her back to the lady that was nice enough to let us have her. So on Friday we drove over to the farm to meet Dixie. She was bred by the people who owned her and so they knew her history and we knew she was a pedigree Jack Russell and so we seriously hoped that I would be fine with her. I know we normally only go for rescue dogs but this was too good an opportunity to pass up. 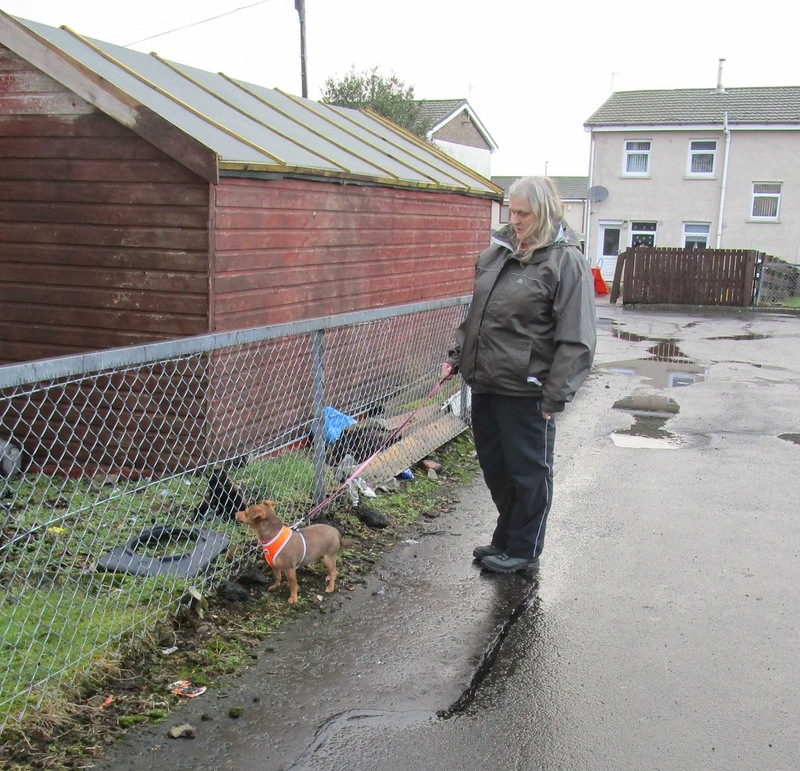 After hubby had spent time cuddling Dixie's gran who he wanted to smuggle home as well as Dixie, and we met her mum who had more pups three weeks ago, we headed home with Dixie. We got Dixie home and let her out the back door to have a snoke around, we have a fully fenced in garden so we knew she would be safe. We then let her explore the house and we left her to wander around downstairs as she felt like it. This is all very strange to her as she has only ever known the farm she was born into, has always had other dogs around her as well as children. 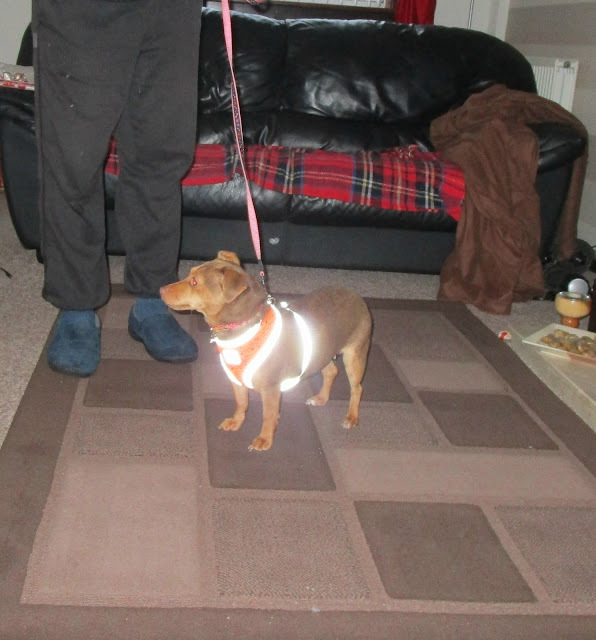 She has never walked on a lead as she has never needed to and she is not use to roads and traffic either. She attached herself to hubby and followed him everywhere, did not leave his side. She did not eat or drink much and was reluctant to go into the garden, so we coaxed her with pieces of cooked chicken. She did dirty at the top of the stairs before bedtime but we had expected accidents so was not surprised by that. We tied getting her to sleep by herself but she did not settle so hubby spent the night with her, she is not use to being alone and it is all very strange to her. She is the most gorgeous shade of brown, with a wee brown nose and hazel coloured eyes. So we now have a bed in the living room for her near the heater, a cushion behind the couch in case she wants to go out of the way, one in the computer/sewing/ironing room up the stairs as well as a cushion in the dog cage that is in our bedroom, the door stays open on the cage. We like a dog to be comfortable going in and out a cage in case they need to go in it for some reason. She still not eating much, but that does not matter. She is drinking water so cant expect much else. We weighed her to keep an eye on her weight to make sure she is not being overfed and putting on weight. We have a rule in this house any dog we have is not allowed to scrounge and is expected to go in their bed while we eat. Now this training has to start somewhere, so today I have been encouraging Dixie into her bed by calling her into it, rewarding her with a piece of cooked chicken and saying "bed" when she gets in. It is the only way she will learn the word bed. I have also been teaching her to come to my call by calling her through the kitchen and when she comes rewarding her with a piece of chicken again. I feel dogs learn well by reward. The same with getting her to go down to the bottom of the garden, reward reward reward. Had another No2 on the top landing, none in the garden off of her so far. Hubby has picked them up and put them down the bottom of the garden where we want her to go. Today I went and bought her a harness. I am not a lover of walking a dog on a collar. The idea is to build up to her having it on it the house so that she feels comfortable with it before we attach a lead. First of all she was for none of it, not wanting to walk with the harness on at all. So I went through to the kitchen and shouted her through, she has learnt if I call her from the kitchen she gets chicken, so through she came. Also bought her some treats, Pets at home do a pick and mix dog biscuit selection, a great way to see what she likes and what she doesn't before I buy big bags of things. Still does not leave hubbys side and if he moves anywhere she is right beside him. 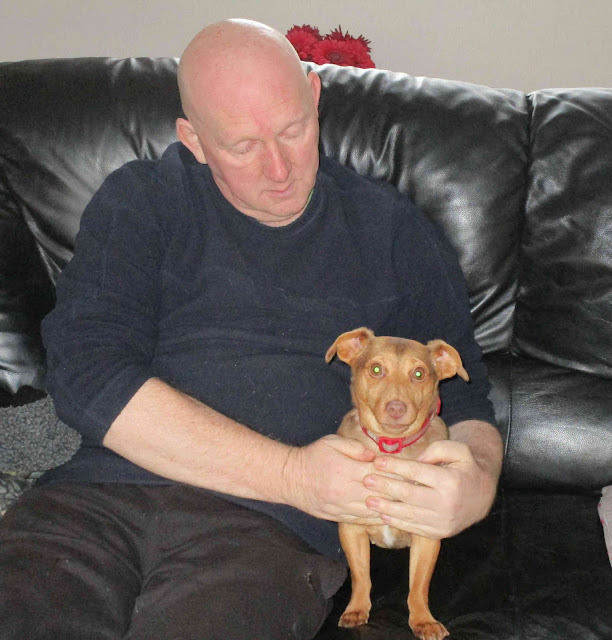 We need to get use to having a dog again and she is so small need to look before we turn round. She is also well matched colour wise to the hall and stair carpet so need to be aware where she is. Eating well today, Ate all her breakfast her tea and pieces of chicken. Have cut her meal size down to allow for the treats she is getting. Have to laugh at her when she barks, she does a wee low growl and then gives the short high pitched bark, quite comical really. 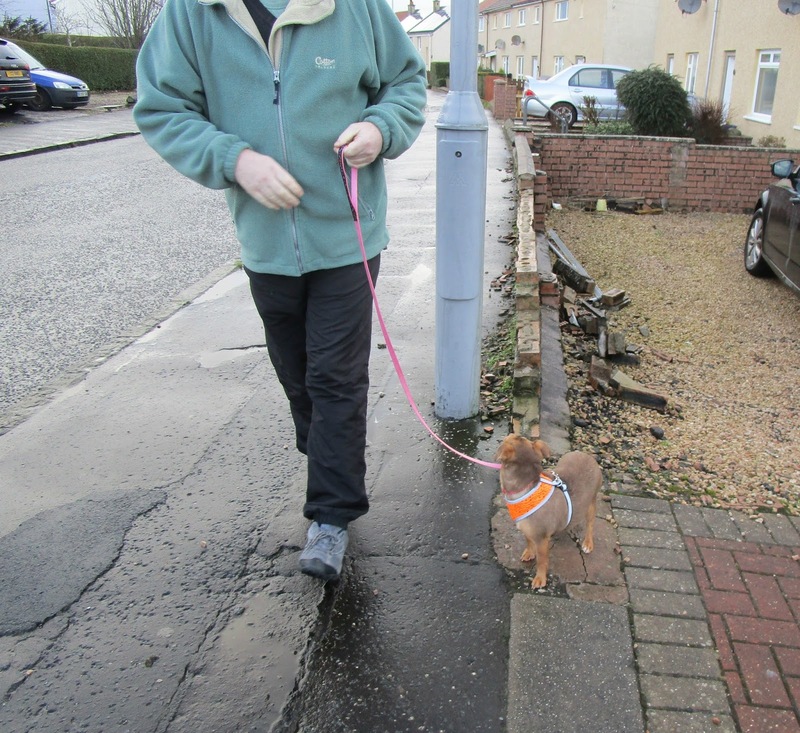 This afternoon we thought we would see how well she might walk on her lead, was not fussy if we only got a s far as next door or along the end of the road, but no she happily walked on the lead, sniffing and smelling everywhere. 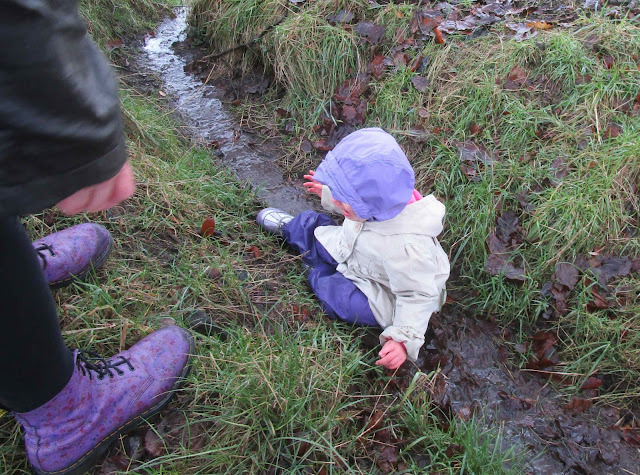 But it was all about getting her out and introducing her to a new experience. She managed fab, took us about 15 mins to get round the block, a walk you could do in about 3, but nothing much seemed to phase her, she ignored the other dogs, not overly keen on walking through the front door when we got back. She did her No2 down the bottom of the garden where we want her to go today, brilliant step forward. She is also getting quite good at taking herself away while we eat, today it is on the other couch, but we can live with that. Really a quick learner. Still right behind hubby where ever he goes. Today we had snow, did not seem to bother her and she was quite happy to go out in it. Also been taking herself off to day to lie in her bed/on the couch but not on top of hubby all the time. Another great step forward, we expected these stages to take much longer. She was great at going into her bed while we were eating. Did not stay there the whole time we ate but did not scrounge. Really pleased with her progress. 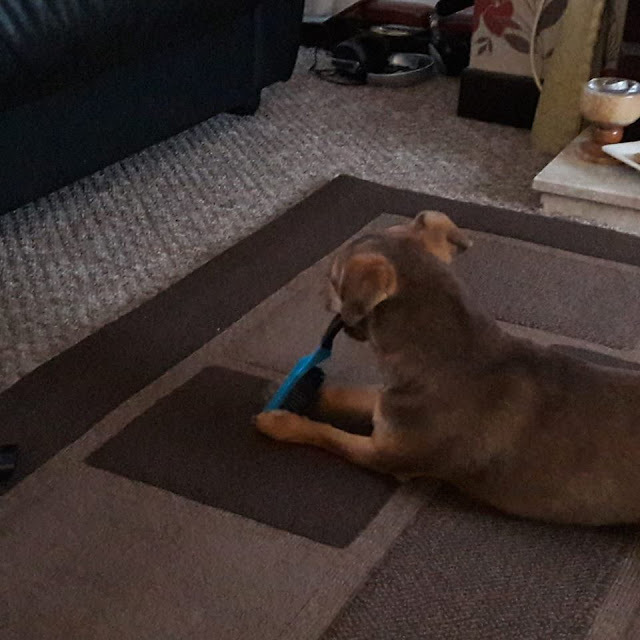 She is learning like our last dog that once we have finished eating and put our forks down she gets shouted across and gets a reward off our plate. Then they know when feeding time is over and that they can come out of their bed. Her character is starting to come out now. She is playing with her teddy and her tug toy I got her. She is a wee monkey for picking things up. Hubby was getting socks out of his drawer and she put her front feet on the drawer and picked out a pair of socks, took them away and dropped them. She also picked up hubbys glasses and took them into her bed.. While hubby was ironing she spent ages snuffling around the shoe cupboard upstairs. I had to nip into town with DD1 so Bob came up here to stay with Granddad. She was not happy she woof and yelp and went seriously nutty. Wasn't aggressive or anything but seriously unhappy about him being in the house. He is the first visitor we have had since we got her so it may be at the moment she just feels uncomfortable with other people. Hubby put her in her cage behind the couch and she quietened down when she could not see him but started barking at him again from a distance. We will need to work on having visitors in. We also appreciate that she has come into heat this week which is a hard time for any dog, but for one that has such upheaval we feel she is doing amazingly. We know it is the wrong time to be trying to teach her new things so still a slowly slowly approach. We went for a walk around the block again. She is not keen on cars passing her but the noise of the snow might not be helping that. Today she went into her bed without being told to when hubby came through with his lunch in his hand. She has learnt this really quick. She also stayed there the whole time he ate, and then gets shouted out and rewarded. Really pleased. She also stayed in her own bed in our bedroom last night and I only had to say to her a few times to go back, she cant quite manage up on our bed unaided in the dark so slides down while trying to get up. We registered her with the vet today.Her behaviour was brilliant, proves she likes people, just not them in her new house at the moment. Also have her on pet insurance for her as well. Same company as last time, did not even look for another company as can not fault the level of service we got. Took her for a walk while we were at the vet so somewhere a bit different than round the block. Many more walks to come in many more areas over the years. Got the eldest granddaughter to visit to see if she would be the same, and yes she was, at the moment it really unnerves her. 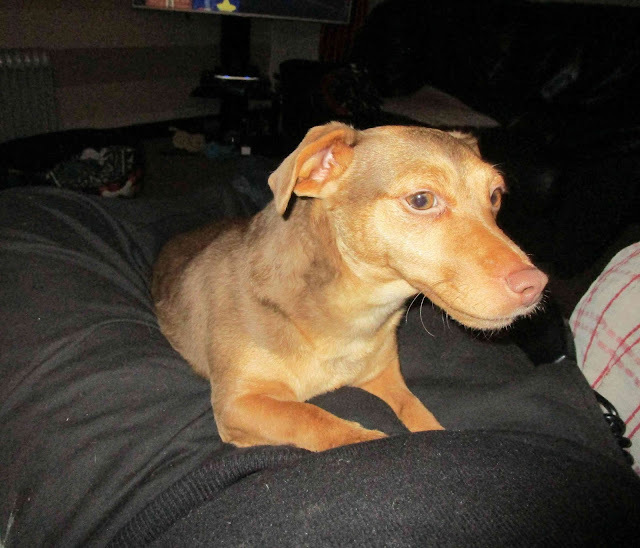 I spent some time on the phone last night to her previous owner as I had videoed her distress and barking. She agrees it is a guarding instinct and not aggression. Another peaceful night with her. This morning I see her again settling in. Normally when hubby leaves the room she wants to go with him. Today he has left her while he goes to wash the dishes and she has settled for some of the time he is not in the room. All small steps in the right direction. She plays chase with the ball now, not bringing it back, picks it up and runs to her bed with it, and we are firm believers a dogs bed is a safe place so we do not go and take it back. start by taking Dixie down to their house when the three younger ones are in bed and seeing how she copes with them in their own house so she gets to know them. 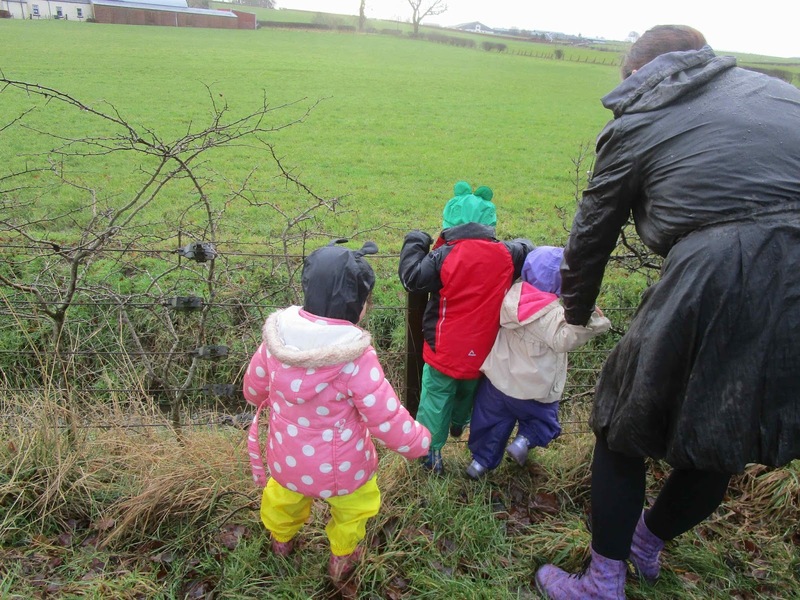 Once she is comfortable with them and I will get them to come for a walk with me and the dog talking as we are going and her getting to trust them. Once we have done this a few times then I will meet them for a walk and bring them back here with us and see how she fairs with them then. I am sure a lot of this will calm down with time and once she has finished being on heat. One step at a time for her. Lots more updates to come. Dealing with feeling the pinch. It is January and I think most of us will be feeling the pinch of Christmas,we get paid early and so it is six long weeks between being paid in December and the next pay at the end of January. So we all need to find ways to eek out what we have to tide us over. There are many ways of doing this, from treats like these cheap Cadbury deals to looking for bargains in the supermarkets and utilising the freezer. I had gone into the supermarkets before Christmas and one was doing a kilo of carrots or three leaks or a kilo of parsnips all for twenty pence each. I also did some shopping on Christmas Eve and braved it purely for the knock downs - peppers, courgettes, potatoes, and butternut squash for pennies. These were all prepared and popped into the freezer, keep them in good condition and make them easier to use and means no waste at all. I have been making cheap meals in the last few week. We have a local place that was doing chicken thigh pieces on a BOGOF deal in the month of December and so as I had let my freezer run down I went and bought eight bags for the price of four, so for a mere £10 I got enough chicken to do us an average of twelve nights. 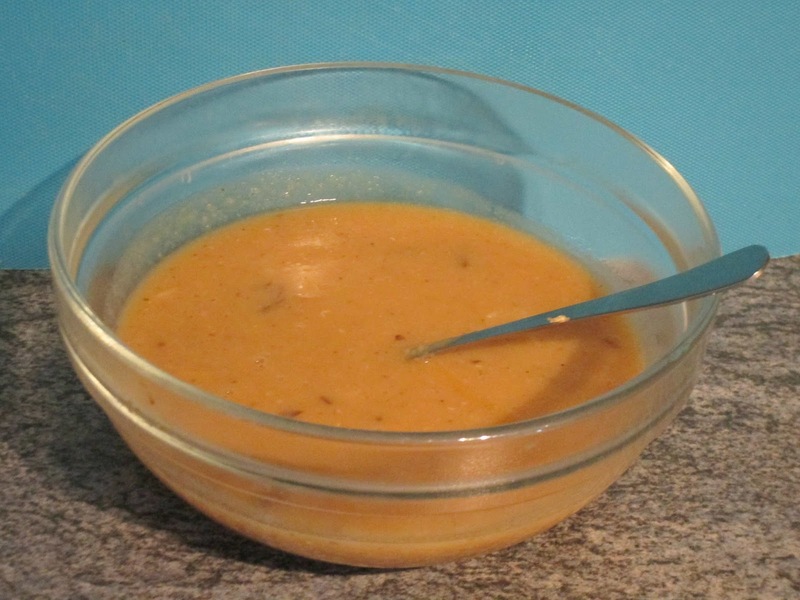 On Saturday I did chicken in a jar of korma sauce in the slow cooker. I cooked ten pieces, we ate three each that night and I left the other ones to go cold. When I had taken the chicken out I added some carrots,peppers broccoli, leeks and parsnips and left them to cook until bedtime in the left over korma sauce, made a great lunch in this snowy weather. I shredded one of the cooked pieces of chicken through it when I reheated it for lunch. With the other three pieces of chicken the plan had been chicken omelette and chips, so on Monday night while I was doing the gymnastics run hubby dug out peppers courgette and sweetcorn from the freezer, chopped an onion and whisked up four eggs. I fried off the vegetables for five minutes before adding the eggs , grated some cheese over the top which I melted under the grill and dished it up, it was at that point hubby reminded me I had forgot to add the chicken.....so we ate it cold along side the hot food. I do wonder about my memory at times. It tasted great anyway. 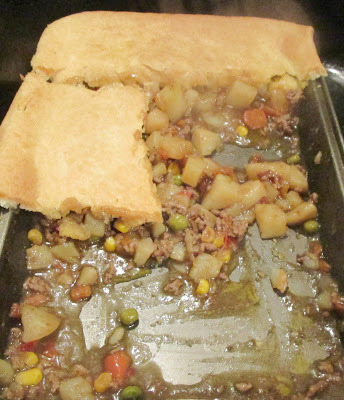 DD1 had been in the supermarket the other week and had picked up twin packs of ready rolled pastry for 25p as they only had a few days to go so with this I decided to make a meat and potato pie. The pastry freezes and being individually wrapped so I only needed to take one out of the freezer. 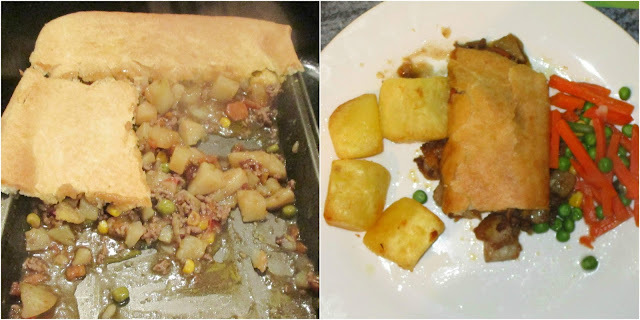 Brown off the mince and onion, this works better with cheaper mince with the higher fat content as it has a better flavour to add to the vegetables and potatoes. Add stock as per your families taste, and I popped in carrots, peppers, butternut squash ( all taken from the freezer) and some diced potato, cooked for twenty minutes until all the veg was soft, poured it into a oven proof tray and topped with a sheet of pastry. Cook at 170 oC for about 15 mins until the pastry was cooked. A nice easy all in one meal that did one night on its own and another night with a few roast potatoes and some veg. I have a halogen oven so no need for the big oven just for a few potatoes. I also have some rice krispies to use up as DD2 had bought some when she was here over Christmas, and when clearing out my baking cupboard I had found some bars of dark chocolate that I use for baking Again nothing posh about them, basic white label dairy free 100g for 30p in the sweet aisle.. So to start it was just melted chocolate with the krispies and spread them into a flan dish and left them to cool. Meanwhile I made a sugar free raspberry jelly with only a 1/4 pint of water, and then topped it up to a pint with soya milk to make a milky jelly. 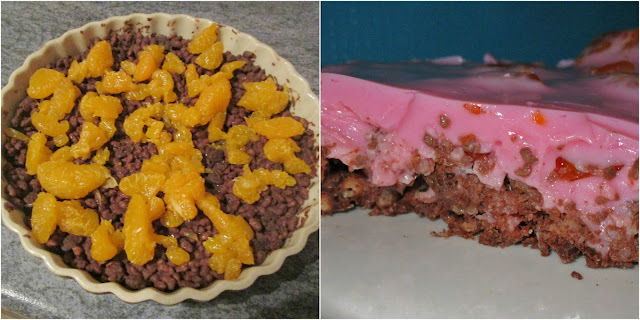 When the jelly was on the point of setting I covered the krispie base with a tin of drained broken mandarin segments but basic peach slices or fruit cocktail would have worked as well. Then I poured the jelly on top. So you have a nice compromise here, healthy milky sugar free jelly full of calcium with some fruit to combat the chocolate in the base. So how are you handling feeling the pinch? Do you have any hints or recipes to share, please add your links in the comments. Took advantage of the crisp afternoon weather and went for a walk along the river at Auchincruive. Needed to nip into the town to buy some wood to sort the shed that is being moved so combined the two into one. Not sure why these were running free but they were certainly slowing down the traffic flow. The school are back and so the after school activities are back. Bob does gymnastics in the next village so makes it easier for DD1 if somebody else takes him. 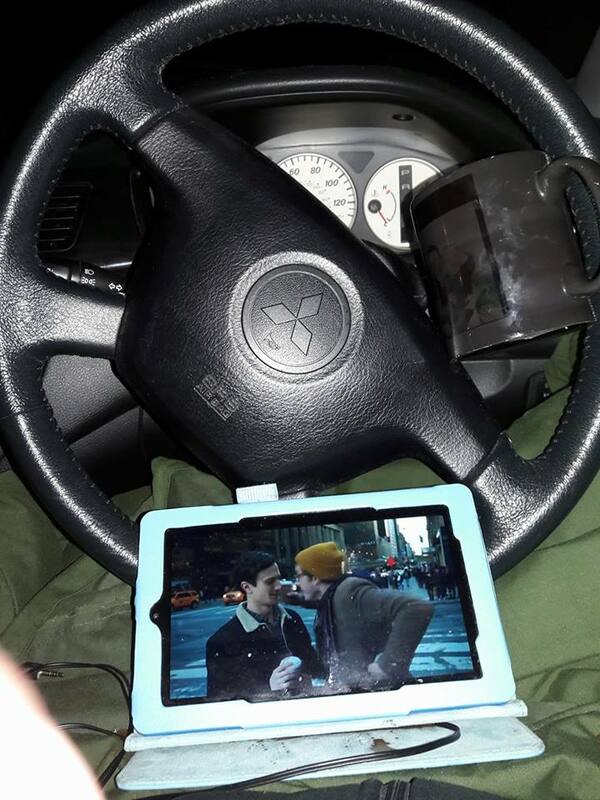 Some days I go for a walk, some days I sit in the library, but today I decided to sit in the car I watched an episode of Quantico I have downloaded on my kindle and took a flask of hot chocolate with me. I am sure somewhere we have the keep warm cups so will need to find one. A casual conversation with a neighbour over something totally different leads to a new pine bed frame for the front bedroom. Less squeaky than the metal frame that was there. 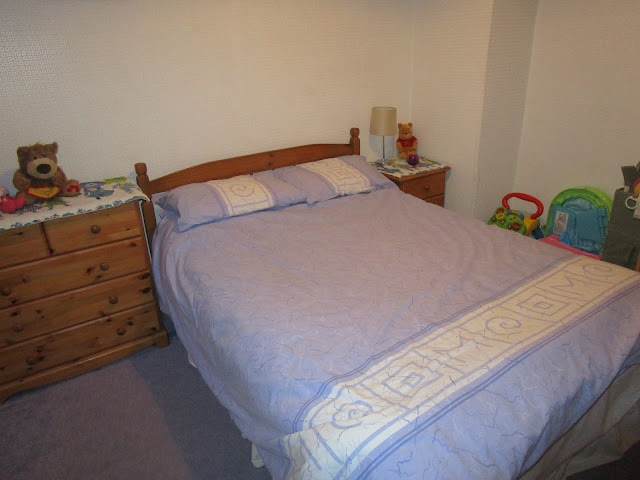 It is the spare bed and only used when DD2 comes to stay. One spare black frame in excellent barely used condition now looking for a new home. Spent a few hours going through various blogging sites applying for any compatible opportunities. Those I did not feel I could do justice to I asked them if they would want to collaborate with me and supply a competition prize come April. Nothing ventured nothing gained. Really being organised and adding them to a google document so I can keep track of what and when I have applied for. DD1 needs to register the twins for starting school in August. She has her reasons for not wanting to use the local one so I watched Bob and Spud while she and SIL1 went to look at an alternative. 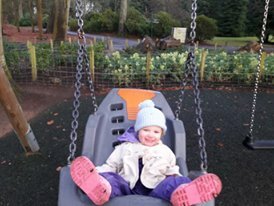 DD1 realised that her MOT had run out on her car as I needed to bring her and her shopping back from the town so took the kids to play in a local park. At the moment Spud has the same attention span as Minky had at that age, ten seconds on one thing, six seconds on another. Had a physio appointment in the afternoon, got signed off as now just need to keep up with the exercises and get back to work. 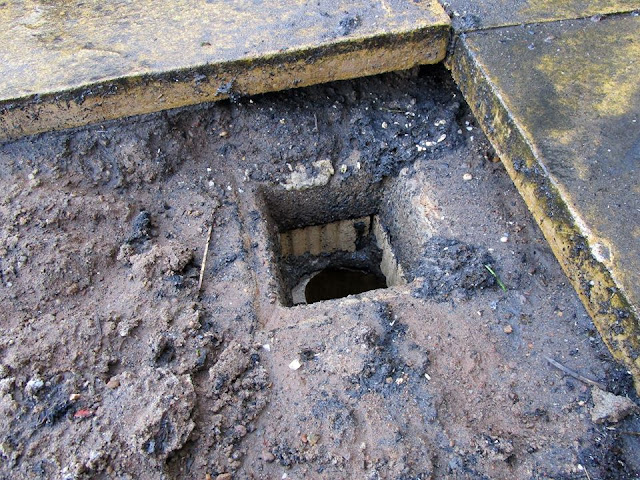 stantially cheaper than the drain clearing companies, so it is not sorted. Turns out when the drains were originally laid somebody had left a chuck of wood in there and everything had got caught in it. I saw an opportunity from a company called Giggle Knickers, loved the name so went for a look at their website and applied for a pair to review. Giggle Knickers® are a New super-soft, light weight, washable cotton knicker with a hi-tech protective panel that gives you total security without the bulk or bother of disposable pads. Giggle Knickers Ltd® was developed to create a normal looking washable pair of knickers for the thousands of women out there with a sensitive bladder. Now these suited me as they are what are commonly called Bridget Jones knickers, the only design they make at the moment, but there is an option on their website to choose to - help shape their future - you can opt for boy shorts, high leg, bikini or thong, personally not sure the thong would do much of a job but each to their own. Being a woman of nearly sixty I admit I tend to wear a small incontinence pad most days, rarely do I need them but any of us can have a hard cough come on or we need to run after a grandchild or jump like a bunny with them. So having worn them twice since I got them I have to say I find them very comfortable you really do not notice any difference than with my normal Bridget's. I felt clean, dry and fresh all day and had no discomfort at all. 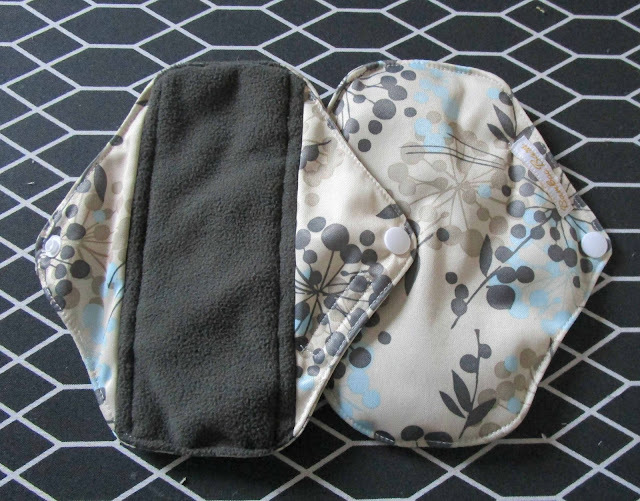 Nice to not have a disposable pad on and think of the positive effect on the planet. They are currently on sale at £12.99 a pair which may sound quite expensive but not only will they save money from having to buy disposables all year, they will also help to save the planet with less rubbish in landfills. Only time will tell how well they wash and wear. A short sentence for those coming across my blog for the first time through this project. The Grandchildren are Fifi (15) Bob (11) Minky and Dinky ( boy/girl twins of 4) and Spud (21months) they all belong to DD1 and live just round the corner. 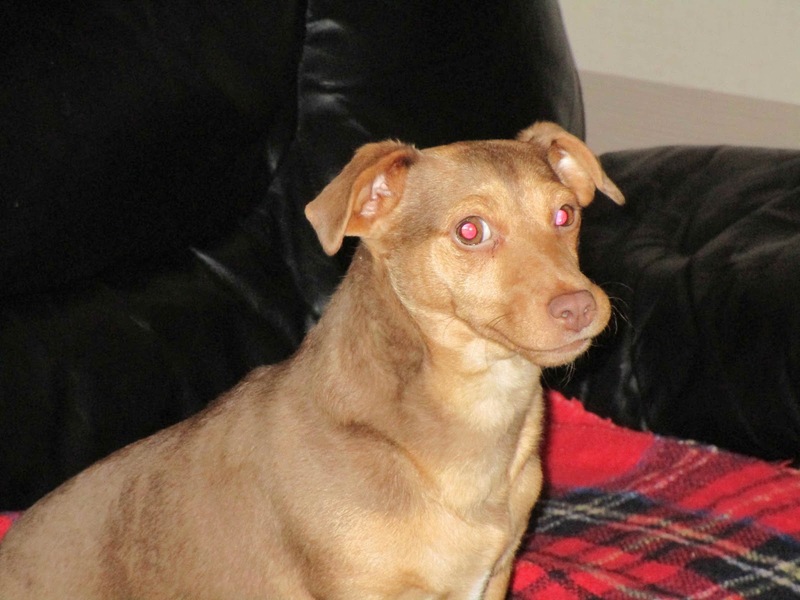 Ziggy is DD2's only child and is 16 months, they live approx 2 hrs away in Oban. DD3 does not have any children, the two sons ( and the seventh grandchild) choose not to appear on the blog. Well here we go again, will I complete another year?...only time will tell. Toyed with the idea of stopping blogging last year as really my blog is boring, but decided to carry on and see if I can be bothered to make something more of it than just 365. My blog will be seven in April, so going to keep it going until then but after that who knows. Started putting out feelers for prizes to run some giveaway for my anniversary. 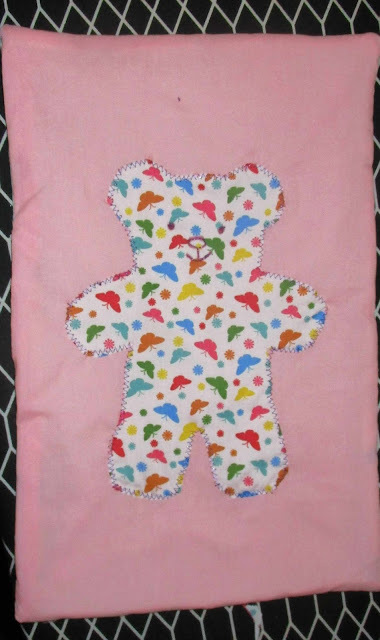 Also done some cross stitching and quilting, need to be pushing the arm to see how it goes as I so want to go back to work when my sick line runs out in two weeks. Hoping I can book in some of my holidays that need using up before the end of March and should be able to get one day every weekend off to ease myself back in slower. 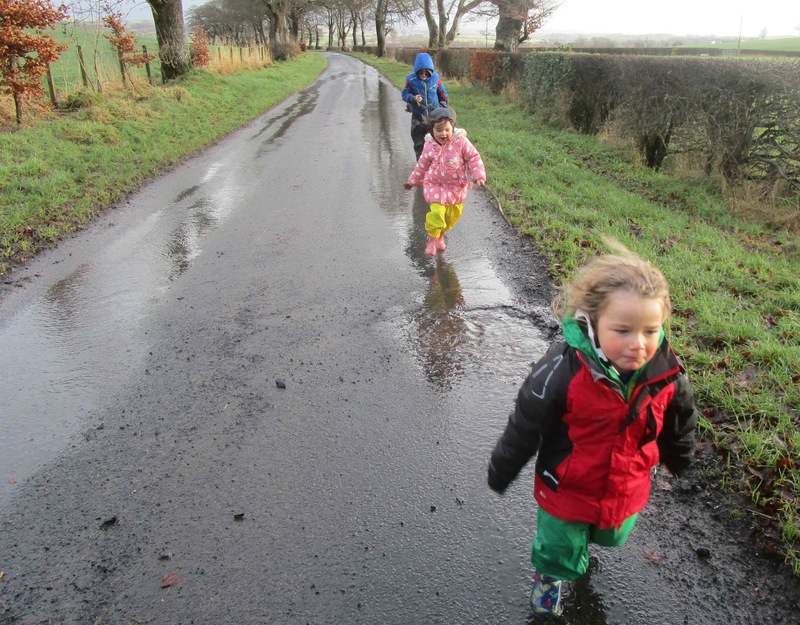 We went down to Irvine to watch the New Year Big Dip. Very brave people indeed, I was cold stood watching. 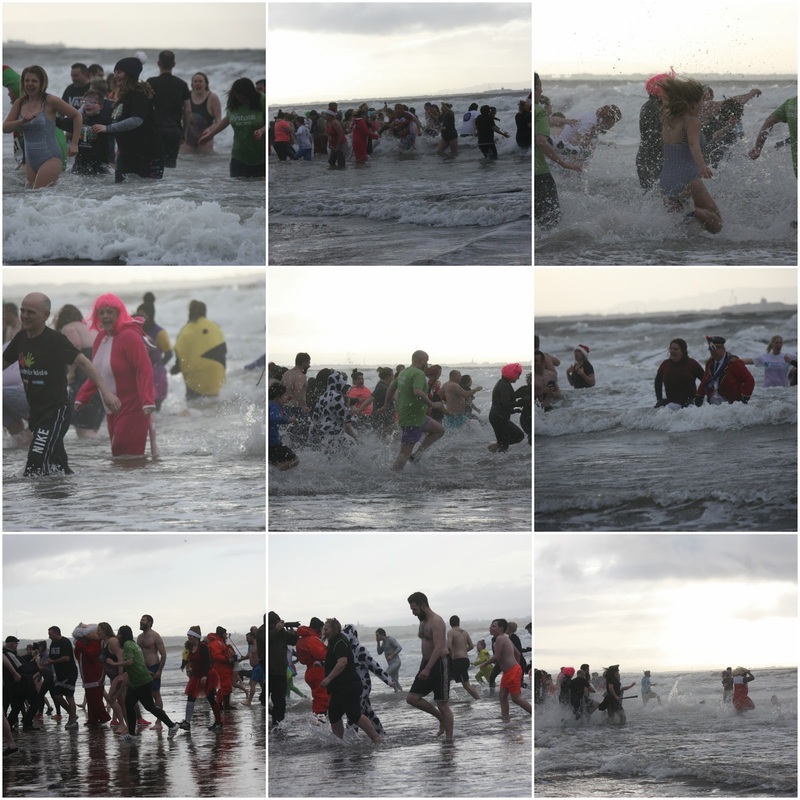 Here is a collage of the people in the sea. Link to my first blog post of the year here if you want a read. 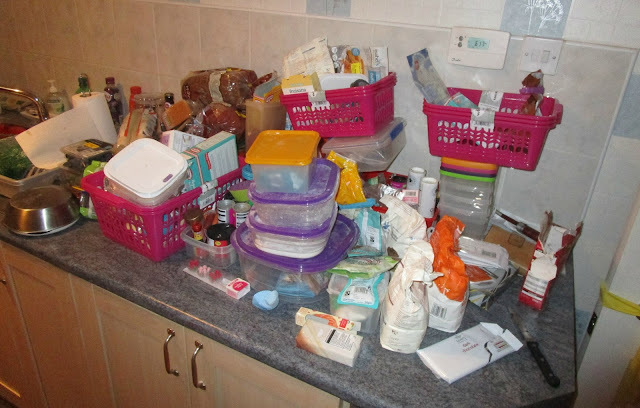 My baking cupboard has grated on one to many nerves in the last week. So today I bought come cheap baskets in the sale in Sainsbury, good old Nectar points, with the intention of sorting it. Hubby decided to put in an extra shelf for me, so I pulled it all out so he could get a shelf in and I knew it would then have to get done. I have tried plastic tubs for ingredients in the past but I get lazy and just leave the stuff in bags. Think I will need to look in Argos to see if they have a two step stool so I can reach up there, may as well use my vouchers. Need one for the stuff stored on top of the cupboards anyway so wont go amiss. Hubby also sorted out the pen drawer as every time I go for a pen they never work, so all the pans sorted and the none working ones thrown away. Got up just after 6 when I woke cos the mess had been left as was busy doing other things last night, and I wanted it sorted, took me just over two hours but it all got put away. I also had enough baskets left so sorted the rice/pasta/tea/coffee as well. Also made a pot of soup and cooked pasta to go with the roast vegetables from last night, not bad before 9am. 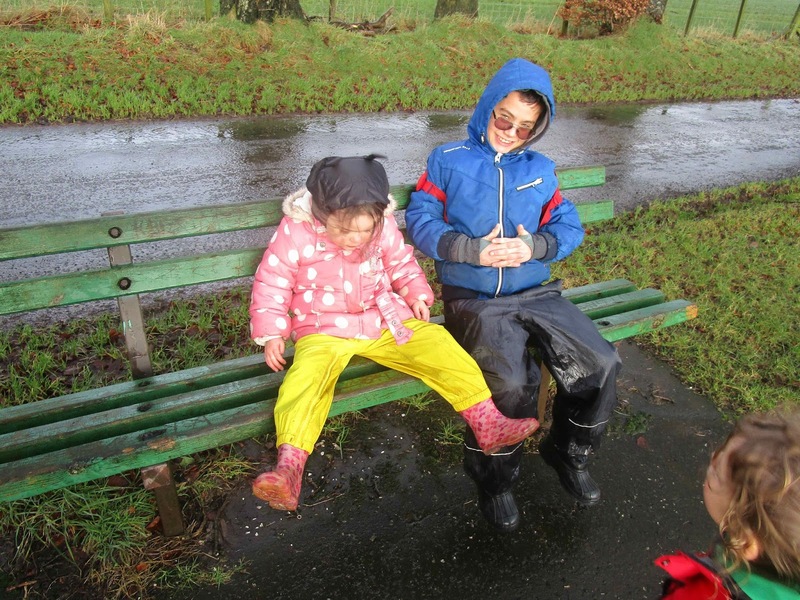 DD1 had phoned to see if I fancied going out with them, but was too wet for the hassle of loading them into the car and driving somewhere with them. So we just took a wander along the back road. Poor Spud ended up soaked and freezing and poor wee soul cried most of the way home. You can read our walk post here. Not much of a post but enough to be memories for them when they get older. Made a blanket for Spud's dolls pram that I was planning on making for her Christmas but could not manage. This is part of pushing my arm to see how it goes. Have halved my pain killers again this week though still taking the two tablets every night for the nerve pain. Just need to add her name to the bottom. It has a padded back. 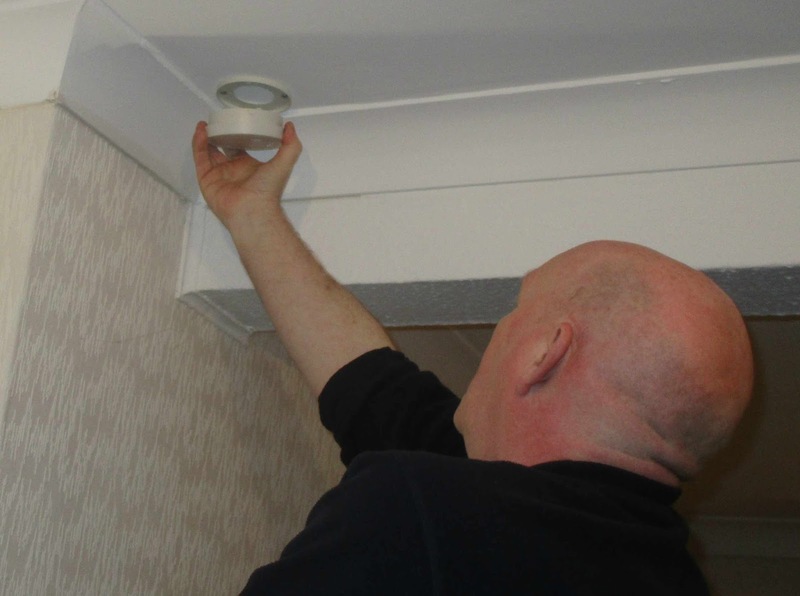 We change the smoke alarm batteries every new year, so today they were changed. That is them until next January. Hubby has been wanting to move the small shed from the top of the garden down to the bottom since we moved in, but we needed to buy the other shed to store the contents in until it could be done, so having got the new shed up and organised he decided today was the day to make a start. Luckily enough the neighbour helped with this. Went for a walk along the river in the afternoon, cold but sunny. Nothing worse for young children than being stuck indoors because the weather is awful so what do we do on a cold wet day? 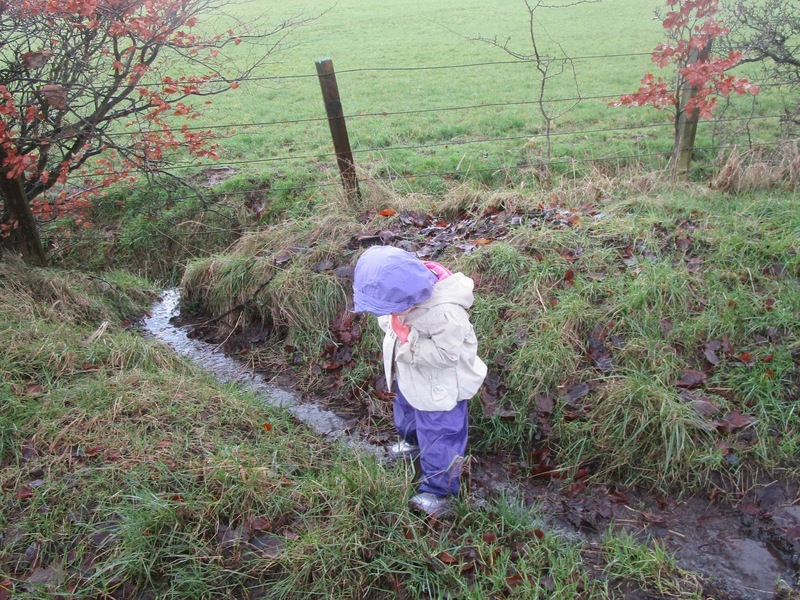 We put on wellies and waterproofs and go out and embrace it. SIL1 went back to work this week, he works for a holiday camp and they close for six weeks over the winter period, so that is when he gets his holidays. So having had him off for six weeks the children have got used to him being there and Spud in particular misses him. So DD1 is looking for things to do with them to get them out to distract them. 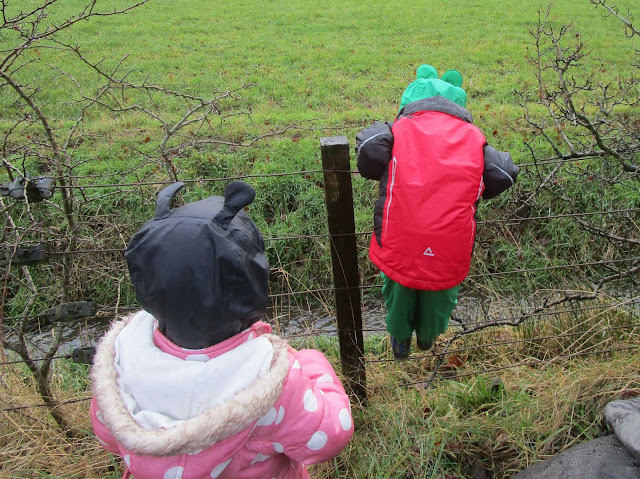 We had toyed with popping them into the mini bus and going somewhere but it was just to wet to go to that hassle, so we decided to go for a walk, the park is waterlogged after so much rain, so we opted for the back road instead. 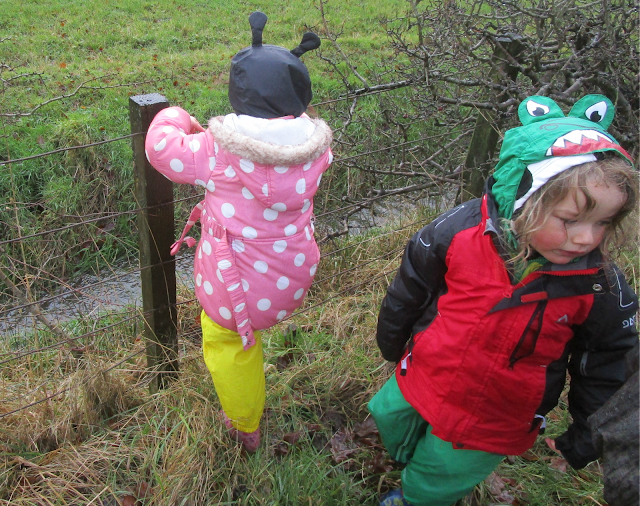 So dressed in waterproof suits with a jacket on top and wellies we ventured out. It really was just a walk, we did not get overly far but the children thoroughly enjoyed it. There was one point a van passed us and we moved onto the grass verge out of the way, and poor Bob was stood near a puddle, and yes you guessed it, the van soaked him.....drenched from head to toe, and the look on his face as he just stood there in total disbelief, and being the loving adults we are we could do nothing but laugh.....his face was such a picture. He then saw the funny side and starting laughing as well. Spud tends to forget she is still only one and tries to copy everything that Minky does. 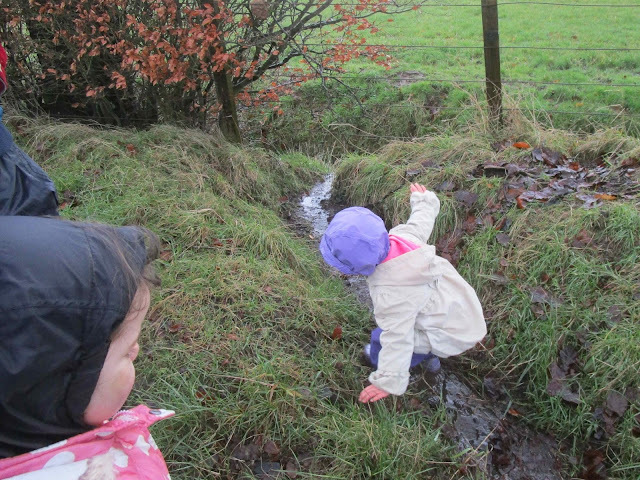 This of course leads to her falling over or slipping and sliding. 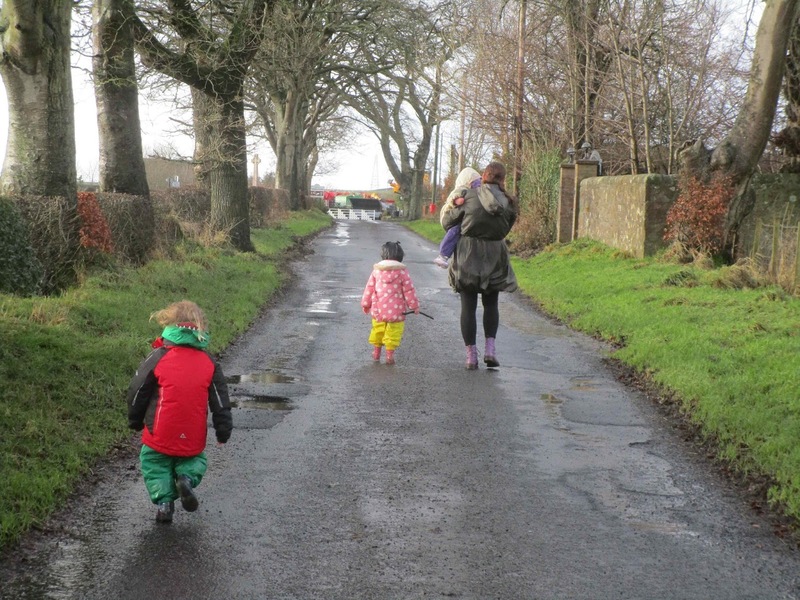 For half of the walk Dinky was holding her mum's hand, but Spud objects to having to hold on and follows Minky into everywhere. 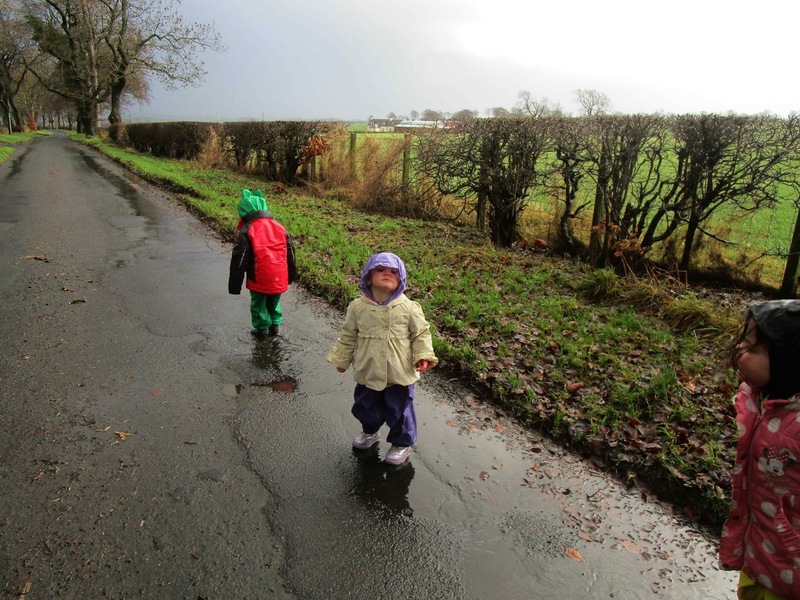 We passed a group of walkers who were rather wet and muddy, they had been for a walk to and round the woods. They were a bit surprised to meet people out for a walk and were laughing at the children's pleasure in puddle jumping. poor Spud is cold and had enough so got carried most of the way home. 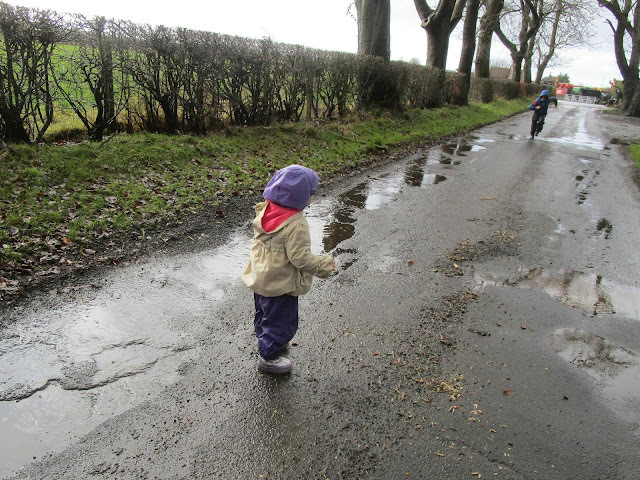 Spud fell in the puddle that they were all playing in, the water splashed on her face so daughter wiped it off before wiping her hands. 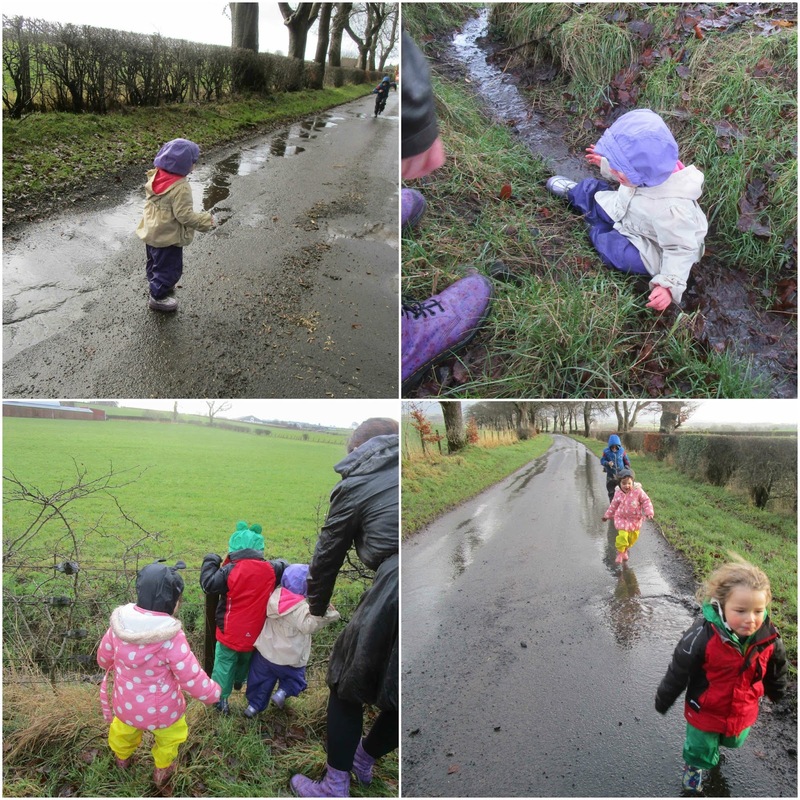 Was quite amazed the twins socks and clothes were still bone dry when we got back, unlike poor Spud who's wellies were full of puddles, her socks and trousers soaked as well as her jumper sleeves, no wonder she was cold. But she would not have wanted to stay in her pushchair had we taken in, she likes to join in. The older children would never have been allowed to splash in puddles at this age but very difficult to stop a younger sibling so close in age. DD2 was laughing at the video, Bob has started calling me Grandmama when I phone, so now Minky calls me that as well but he had developed an English accent from somewhere and it is really rather comical.